Cat senses are adaptations that allow cats to be highly efficient predators. Cats have acute sight, hearing and smell, and their sense of touch is enhanced by long whiskers that protrude from their heads and bodies. 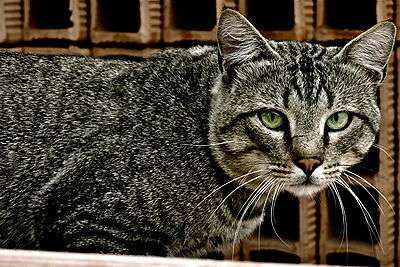 These senses allow cats to hunt effectively in dim light and at night. Cats, like dogs and many other animals, have a tapetum lucidum, which is a reflective layer behind the retina that sends light that passes through the retina back into the eye. While this improves the ability to see in darkness, it appears to reduce net visual acuity, thus detracting when light is abundant. In very bright light, the slit-like pupil closes very narrowly over the eye, reducing the amount of light on the sensitive retina, and improving depth of field. Big cats have pupils that contract to a round point. The tapetum and other mechanisms give the cat a minimum light detection threshold up to seven times lower than that of humans. Variation in color of cats' eyes in flash photographs is largely due to the reflection of the flash by the tapetum. Cats have a visual field of view of 200° compared with 180° in humans, but a binocular field (overlap in the images from each eye) narrower than that of humans. 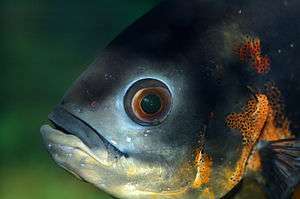 As with most predators, their eyes face forward, affording depth perception at the expense of field of view. Field of view is largely dependent upon the placement of the eyes, but may also be related to the eye's construction. 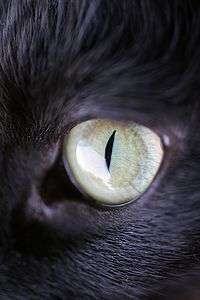 Instead of the fovea, which gives humans sharp central vision, cats have a central band known as the visual streak. Cats can see some colors, and can tell the difference between red, blue and yellow lights, as well as between red and green lights. Cats are able to distinguish between blues and violets better than between colors near the red end of the spectrum. A 2014 study found that, along with several other mammals, cats lenses transmit significant amounts of ultraviolet (UVA 315–400 nm) light, which suggests that they possess sensitivity to this part of the spectrum. Cats have a second eyelid, the nictitating membrane, which is a thin cover that closes from the side and appears when the cat's eyelid opens. This membrane partially closes if the cat is sick, although in a sleepy state this membrane is often visible. Cats struggle to see still water, and will often disrupt the surface with their paws or lick water off their paws. Cats often sleep during the day so they can "hunt" at night. Unlike humans, cats do not need to blink their eyes on a regular basis to keep their eyes lubricated (with tears). "Do cats blink?". Unblinking eyes are probably an advantage when hunting. Cats will, however, "squint" their eyes, usually as a form of communication expressing affection and ease around another cat or human. A white kitten with heterochromatic eyes. Humans and cats have a similar range of hearing on the low end of the scale, but cats can hear much higher-pitched sounds, up to 64 kHz, which is 1.6 octaves above the range of a human, and even 1 octave above the range of a dog. When listening for something, a cat's ears will swivel in that direction; a cat's ear flaps (pinnae) can independently point backwards as well as forwards and sideways to pinpoint the source of the sound. Cats can judge within three inches (76 mm) the location of a sound being made one yard (91 cm) away—this can be useful for locating their prey. 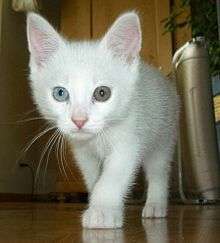 It is a common misconception that all white cats with blue eyes are deaf. This is not true, as there are many blue-eyed cats with perfect hearing. However, white cats with blue eyes do have slightly higher incidences of genetic deafness than white cats of other eye colors. White cats having one blue and one other-colored eye are called "odd-eyed" and may be deaf on the same side as the blue eye. This is the result of the yellow iris pigmentation rising to the surface of only one eye, as blue eyes are normal at birth before the adult pigmentation has had a chance to express itself in the eye(s). A domestic cat's sense of smell is about fourteen times as strong as humans'. Cats have twice as many receptors in the olfactory epithelium (i.e. smell-sensitive cells in their noses) as people do, meaning that cats have a more acute sense of smell than humans. Cats also have a scent organ in the roof of their mouths called the vomeronasal (or Jacobson's) organ. When a cat wrinkles its muzzle, lowers its chin, and lets its tongue hang a bit, it is opening the passage to the vomeronasal. This is called gaping, "sneering", "snake mouth", or "flehming". Gaping is the equivalent of the Flehmen response in other animals, such as dogs, horses and big cats. 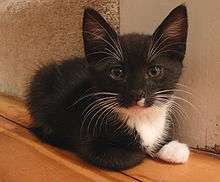 Whiskers on the face of a tuxedo kitten. A cat has about twenty-four movable vibrissae ("whiskers"), in four sets on each upper lip on either side of its nose (some cats may have more). There are also a few on each cheek, tufts over the eyes, bristles on the chin, the cat's inner "wrists", and at the back of the legs. The Sphynx (a nearly hairless breed) may have full length, short, or no whiskers at all. The structure of the brain region (barrel cortex) which receives information from the vibrissae is similar to that found in the visual cortex which permits the cat to create a three-dimensional map of its surroundings. This doesn't mean that sensing with vibrissae is a type of vision. It is still a touch sensation and environmental information is built up incrementally (in small steps). Vibrissae aid sensation and navigation. The upper two rows of whiskers are able to be moved independently from the lower two rows for greater precision during measurement. A cat's whiskers are more than twice as thick as ordinary cat hairs, and their roots are three times deeper in a cat's tissue than other hairs. They have numerous nerve endings at their base, which give cats extraordinarily detailed information about nearby air movements and objects with which they make physical contact. They enable a cat to know that it is near obstacles without it needing to see them. Whiskers also aid in hunting. High speed photography reveals that when a cat is unable to see its prey because it is too close to its mouth, its whiskers move so as to form a basket shape around its muzzle in order to precisely detect the prey's location. A cat whose whiskers have been damaged may bite the wrong part of its prey, indicating that they provide cats with detailed information about the shape and activity of its prey. The cat family was shown in 2005 to lack the TAS1R2 protein, one of two required for function of the sweetness sensory receptor; a deletion in the relevant gene (Tas1r2) causes a shift in the genetic reading frame, leading to transcription stopping early and no detectable mRNA or protein produced. The other protein, TAS1R3, is present and identical to that of other animals, and the relevant taste buds are still present but inactive. Such a genetic marker found in the entire family and not other animals must be the result of a mutation in an early ancestor; as a deletion mutation it could not revert, and thus would be inherited by all descendants, as the evolutionary tree branched out. Some scientists now believe this is the root of the cat family's extremely specialized evolutionary niche as a hunter and carnivore. Their modified sense of taste would cause them to some degree to ignore plants, a large part of whose taste appeal derives from their high sugar content, in favor of a high-protein carnivorous diet, which would still stimulate their remaining taste receptors. ↑ Braekevelt CR (1990). "Fine structure of the feline tapetum lucidum". Anat Histol Embryol. 19 (2): 97–105. doi:10.1111/j.1439-0264.1990.tb00892.x. PMID 2240589. ↑ Hughes A (1975). "A quantitative analysis of the cat retinal ganglion cell topography". J. Comp. Neurol. 163 (1): 107–28. doi:10.1002/cne.901630107. PMID 1159109. ↑ Guenther, Elke; Zrenner, Eberhart (April 1993). "The Spectral Sensitivity of Dark- and Light-adapted Cat Retinal Ganglion Cells" (PDF). Journal of Neuroscience. 13 (4): 1543–1550. PMID 8463834. ↑ Lewis, Tanya (18 February 2014). "Cats and Dogs May See in Ultraviolet". LiveScience.com. ↑ R. H. Douglas; G. Jeffery (19 February 2014). "The spectral transmission of ocular media suggests ultraviolet sensitivity is widespread among mammals". Royal Society Publishing: Proceedings B. doi:10.1098/rspb.2013.2995. ↑ "What Your Cat's Body Language Is Saying". WebMD. Retrieved 29 January 2013. ↑ "Frequency Hearing Ranges in Dogs and Other Species". ↑ Muriel Beadle (29 October 1979). Cat. Simon and Schuster. p. 164. ISBN 978-0-671-25190-1. ↑ Geigy CA, Heid S, Steffen F, Danielson K, Jaggy A, Gaillard C (2007). "Does a pleiotropic gene explain deafness and blue irises in white cats?". Vet. J. 173 (3): 548–53. doi:10.1016/j.tvjl.2006.07.021. PMID 16956778. ↑ Hartwell, Sarah. "White Cats, Eye Colours and Deafness". Retrieved 5 September 2006. ↑ "The Nose Knows". About.com. Retrieved 29 November 2006. ↑ Dykes RW, Dudar JD, Tanji DG, Publicover NG (September 1977). "Somatotopic projections of mystacial vibrissae on cerebral cortex of cats". J. Neurophysiol. 40 (5): 997–1014. PMID 903802. ↑ Gottschaldt KM, Young DW (October 1977). "Properties of different functional types of neurones in the cat's rostral trigeminal nuclei responding to sinus hair stimulation". J. Physiol. (Lond.). 272 (1): 57–84. doi:10.1113/jphysiol.1977.sp012034. PMC 1353593 . PMID 592153. ↑ Nomura S, Itoh K, Sugimoto T, Yasui Y, Kamiya H, Mizuno N (November 1986). "Mystacial vibrissae representation within the trigeminal sensory nuclei of the cat". J. Comp. Neurol. 253 (1): 121–33. doi:10.1002/cne.902530110. PMID 2432098. ↑ Haight JR (September 1972). "The general organization of somatotopic projections to SII cerebral neocortex in the cat". Brain Res. 44 (2): 483–502. doi:10.1016/0006-8993(72)90315-0. PMID 5075705. ↑ Mel Sunquist; Sunquist, Fiona; Sunquist, Melvin E. (2002). Wild cats of the world. Chicago: University of Chicago Press. ISBN 0-226-77999-8. ↑ Li X; Li W; Wang H; et al. (July 2005). "Pseudogenization of a Sweet-Receptor Gene Accounts for Cats' Indifference toward Sugar". PLoS Genet. 1 (1): 27–35. doi:10.1371/journal.pgen.0010003. PMC 1183522 . PMID 16103917.